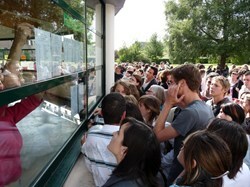 For the 642,235 French students who took the Bac examination this week, it will be a long and anxious wait until results are published nationwide on 6 July. Is it possible to be completely disinterested when engaged in a search for the truth? Can art do without rules? And could you please comment on the chapter in Saint Thomas Aquinas' Summa Theologica on the spirit versus the letter of the Law? These, and a couple of others, were the questions asked to 642,235 French high school students last Wednesday during the philosophy examination of the Baccalauréat. The Baccalauréat, a word derived from the Latin for "laurel crown," was established by Napoleon in 1808. For students completing secondary school, passing the "Bac" gives access to University and higher education. Once reserved to an academic elite (fewer than 100,000 students took the examination in the 1960s) it is now the collective experience of every generation. A ten day-long examination, the Bac requires preparation as rigorous and complex as that of a military campaign—for both the General Staff in the Ministry of Education and for the foot soldiers in every French lycée. Choosing the "subject questions" and organizing the operations takes 13 months and costs the French Ministry of Education more than EUR 50 million. Throughout the country, some 160,000 teachers are mobilized to correct the four million examination papers in philosophy, history, languages, literature, mathematics or physics that the candidates have produced. The Bac provides the media with a basketful of stories: prominent personalities, movie stars and politicians are challenged to take the philosophy test live on the 8 o'clock news; newspapers publish profiles of candidates (the youngest ... the oldest ... the unlucky one trying for the third time ... someone who never took it but managed to succeed in life without ...); the angst and hopes of students ... the Bac is truly a national event that attracts the attention of the whole country. Among the hundreds of thousands of candidates this year, six are students of the International School in Manosque—and only one "ITER child" among them. Five are French, one is American, and they all took the special "International Option" that enables them to sit some exams in a foreign language.